Management direction statements (MDS) provide strategic management direction for protected areas that do not have an approved management plan. Management direction statements also describe protected area values, management issues and concerns; a management strategy focused on immediate priority objectives and strategies; and, direction statements from other planning processes. While strategies may be identified in the MDS, the completion of all these strategies is subject to funding and funding procedures. In addition, all management strategies are subject to the Parks and Protected Areas Branch’s Impact Assessment Policy. The provincial government established the Skeena River Ecological Reserve (E.R. #63) on June 12, 1975 by Order-in-Council 2008/75 under the Ecological Reserve Act. The Protected Areas of British Columbia Act provided legislated status to the ecological reserve boundaries on June 12, 2000. Skeena River Ecological Reserve encompasses seven floodplain islands, three large and four small islands, in the Skeena River with a total area of approximately 91 hectares. The islands are located 55 kilometres west of Terrace adjacent to Highway 16, near the mouth of Exchamsiks River and opposite Exchamsiks River Park. This area lies within the asserted traditional territory of the Tsimshian First Nation. Across the Skeena River from the eastern portion of the ecological reserve lies Exchamsiks River Park. This park performs an important conservation role by protecting a red-listed old-growth spruce-salmonberry plant community and four blue-listed plant communities. In addition, Exchamsiks River Park provides camping opportunities for people travelling the Highway 16 corridor. Gitnadoix River Recreation Area, to the south of the ecological reserve, and Seven Sisters Park east of Terrace provide backcountry recreation opportunities. Protects an extremely small area of the very well represented Kitimat Ranges Ecosection. Skeena River Ecological Reserve is one of 8 protected areas in this ecosection. Currently 18.14% of this ecosection is included in the protected areas system. Skeena River Ecological Reserve’s contribution to the representation of this ecosection is minimal (0.03%). Conserves about 91 hectares of the CWHvm (Coastal Western Hemlock very wet Maritime subzone, Submontane variant). This variant is very well represented in the protected areas system (16.62%). Skeena River Ecological Reserve contributes only 0.09% to the overall representation of the CWHvm. Protects unlogged floodplain islands where natural interactions between fluvial processes and floodplain vegetation actively occur. Contains the following rare plant communities that are listed with the Conservation Data Centre: CWHvm1/09 site series Sitka spruce / salmonberry (Picea sitchensis / Rubus spectabilis) (Red- listed), and CWHvm1/10 Black Cottonwood / Red-osier Dogwood (Populus balsamifera ssp. tricocarpa / Cornus stolonifera) (Blue-listed). Preserves habitat that may be important for moose calving and over-wintering. Allows research on natural processes of island accretion and erosion, and on vegetation succession on floodplain islands. Provides the potential for public education about large-scale hydrological processes such as material deposition and erosion in a free-flowing large river, and the relationship to ecology and vegetation. • Environmental Stewardship Division does not have knowledge of cultural resource information for these islands. Local First Nations have been working, however, on traditional use studies that may provide additional information about the ecological reserve lands. 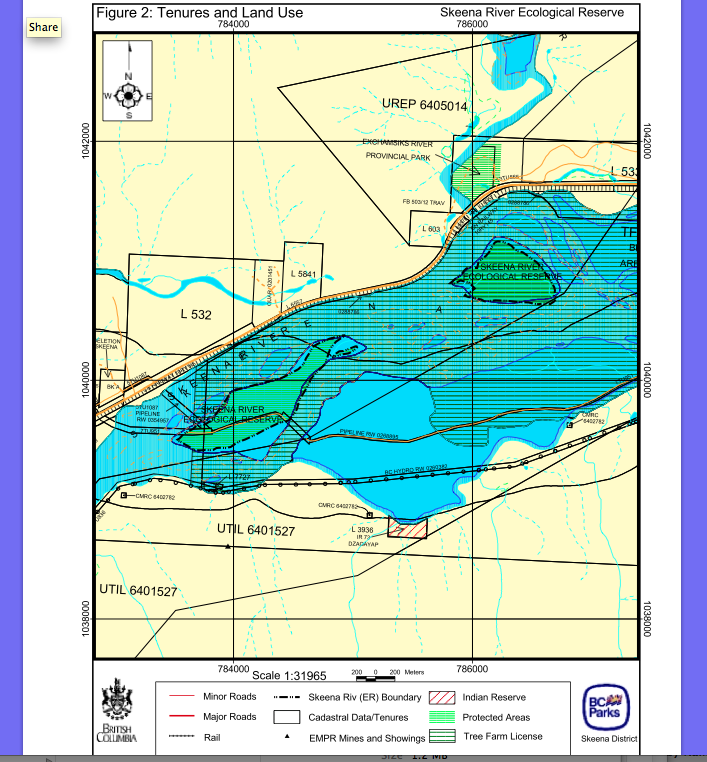 Protects an important but small floodplain ecosystem located in one of the few rivers in British Columbia large enough to maintain the processes of island accretion and erosion. Preserves a provincially significant intact black cottonwood floodplain ecosystem and associated vegetation succession. 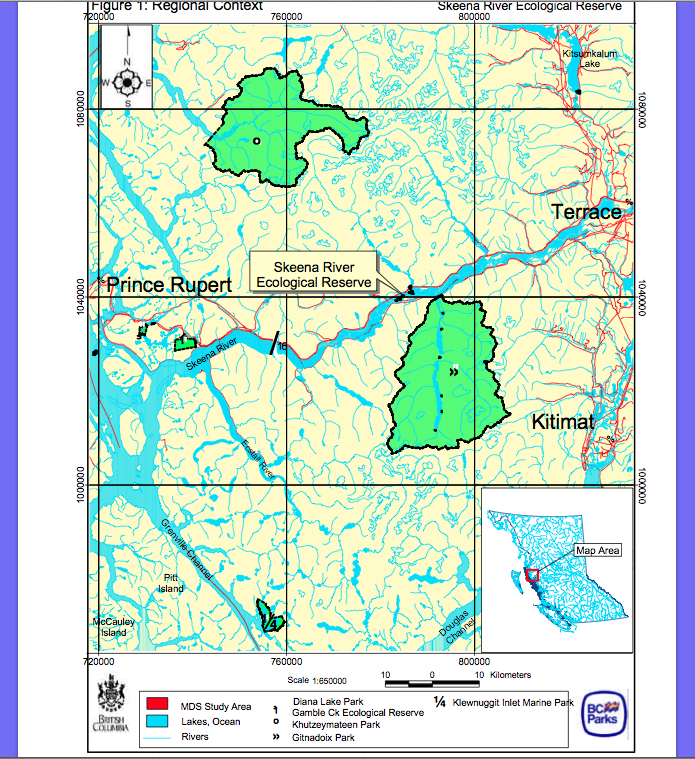 Skeena River Ecological Reserve is located 55 kilometres west of Terrace south of Highway 16. Access to the ecological reserve is by boat. A boat launch is located at Exchamsiks River Provincial Park on the adjacent north shore of the Skeena River. • A natural gas pipeline right-of-way, owned by Pacific Northern Gas, crosses the most western island of the ecological reserve. The provincial government approved in 2001 the Kalum Land and Resource Management Plan (LRMP) which recommended that an additional two islands be protected within the Skeena River system (mouth of Exstew and Kasiks rivers). The forests on most other islands in the Skeena River have been harvested. The majority of the lowland forests in the area are managed for timber production. Gitnadoix River Recreation Area is on the south shore of the Skeena River and lies about three kilometres southeast of the ecological reserve. Skeena River Ecological Reserve is within the asserted traditional territory of the Allied Tsimshian Tribes, Metlakatla Band and Kitselas First Nation. The Allied Tsimshian Tribes, Metlakatla Band and Kitselas First Nation are affiliated with the Tsimshian Tribal Council. • The Biodiversity Branch and Fish and Wildlife Recreation and Allocation Branch of the Ministry of Water, Land and Air Protection have an interest in the habitat and wildlife values of the ecological reserve, especially the use of the islands as a possible moose calving and over-wintering grounds. Research and educational institutions have an interest in the special features and benchmark attributes of the ecological reserve. Local ecologists and naturalists have an interest in the continued protection of this ecological reserve. special features and its continued protection. Skeena River Ecological Reserve fulfills a conservation role within the British Columbia protected area system. The ecological reserve protects a provincially significant floodplain ecosystem containing an intact cottonwood forest on fluvial islands that are subject to natural erosion and deposition forces. These islands are physically exceptional within the region. Skeena River Ecological Reserve also serves a research and educational role through the opportunity to learn from the interaction between river processes and vegetation responses. The provision to allow the natural gas pipeline right-of-way is referenced in the order-in-council establishing the ecological reserve. A fisheries information summary and management strategy for the ecological reserve has indicated that the current information about aquatic life in the ecological reserve is adequate and that there are presently no concerns or issues require attention. The ecological reserve’s flora and fauna are relatively unknown because inventory of these values is incomplete, especially for rare plant communities. Erosion of one island is a problem because of the construction of a pipeline crossing. Monitoring of cleared areas for pipeline placement is required to ensure satisfactory revegetation. Damage to the ecological reserve may occur because of inadequate revegetation of disturbed and cleared areas for pipeline placement. Monitoring of the ecological reserve is inadequate because no volunteer ecological reserve warden is in place for this ecological reserve. • Significance of cultural values is unknown because no inventory and research data is available. The public is unaware of the island’s ecological reserve status as no signs identify the ecological reserve boundary. The public is unaware of the ecological reserve because Environmental Stewardship Division regional public information brochures do not identify it. Complete an inventory of flora and fauna, especially of the rare plant communities. accurately recorded for the pre-existing pipeline and/or the recent relocation of it. Continue to monitor the effectiveness of revegetation of the pipeline right-of-way. Continue to require the stabilization of the riverbank at the pipeline crossing. Ensure ecological reserve is adequately signed. monitoring visits and provide site reports. • Investigate and collect information on cultural heritage values. Place signs in the ecological reserve to notify visitors of the area’s ecological reserve status. Develop an electronic public information brochure to place on the official BC Parks’ website that informs and explains the special character of this ecological reserve and its relationship to Exchamsiks River Provincial Park. Environmental Stewardship Division will consult with the Tsimshian people, local stakeholders and adjacent resource users as necessary. The priority for preparing a full management plan for Skeena River Ecological Reserve is ranked as low. Appendix 1. Skeena River Ecological Reserve Table of Acceptable Uses, Activities and Facilities.